Simon Gould, his wife Kay and children Cohan (10) Freya (8) and Pippa (18 months), practicing for the 5K Colour Run in their garden in Whitley Bay. A family are preparing to celebrate Father’s Day in a colourful way. Simon Gould and his wife Kay have signed themselves and their three children – Cohan, ten, Freya, 8, and Pippa, 18 months – up for the St Oswald’s Hospice Kaleidoscope 5k, a powdered paint run around the Rising Sun Country Park on Sunday, June 21. And the Whitley Bay family are prepared to get their white T-shirts covered in powdered paint for charity. Simon, 37, said: “As a family, we have been long time supporters of the hospice and I have completed several physical challenges to raise money for them. 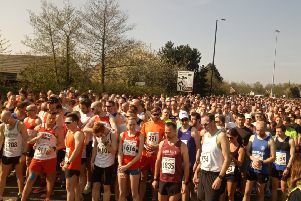 Lucy Smith, St Oswald’s fundraiser, added: “K5K is a great event as it’s suitable for everyone. “We are so pleased to have so many families sign up this year, and with it taking place on Father’s Day, what better way to show your Dad how much you care than by showering him in a rainbow of colour. There are still places available for the Kaleidoscope 5K, which suitable for all ages. An adult place costs £20, age 15 and under is £10, which includes a white t shirt to wear on the day. Under 5s go free.